The geographic distribution of drilling sites can be mapped from space using Visible Infrared Imaging Radiometer Suite data from the Suomi National Polar-orbiting Partnership satellite. These images were produced by NASA using data acquired in April and October 2012. The Bakken Formation supports an unconventional oil and natural gas play in North Dakota and Canada. The main product is oil, but most wells also yield natural gas that has few local markets, storage options, or pipelines. Much of that natural gas is flared. This satellite image was compiled by NASA; the annotations, caption, and inset map were produced by Geology.com. 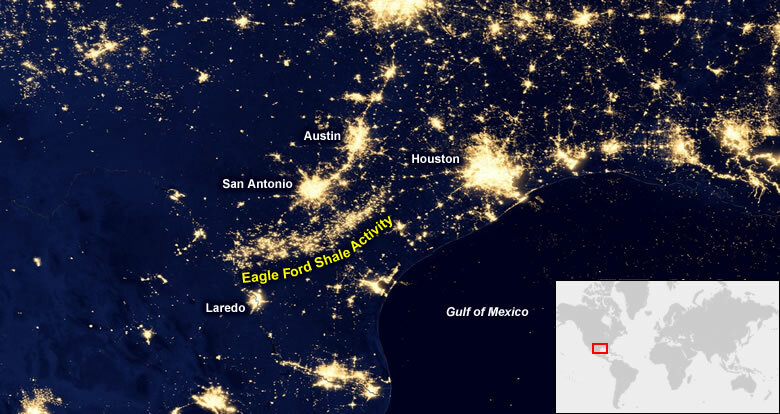 The Eagle Ford Shale of Texas is a crescent-shaped area of drilling activity north of Laredo and South of San Antonio. It is clearly mapped using data from the Suomi satellite which senses electric illumination and heat from natural gas flaring. This satellite image was compiled by NASA; the annotations, caption, and inset map were produced by Geology.com. The North Slope of Alaska is the location of the famous Prudhoe Bay Oil Field. This area produces significant amounts of conventional oil that is transported by pipeline to southern Alaska. 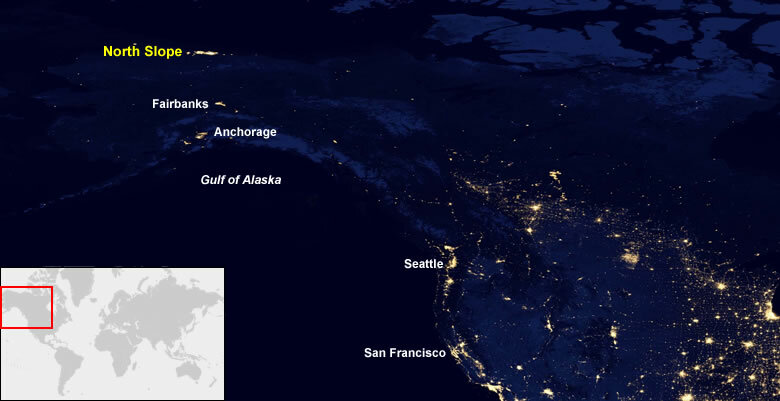 The North Slope has a significant amout of night-time illumination at drilling sites, pipeline facilities, and natural gas flaring. This satellite image was compiled by NASA; the annotations, caption, and inset map were produced by Geology.com. 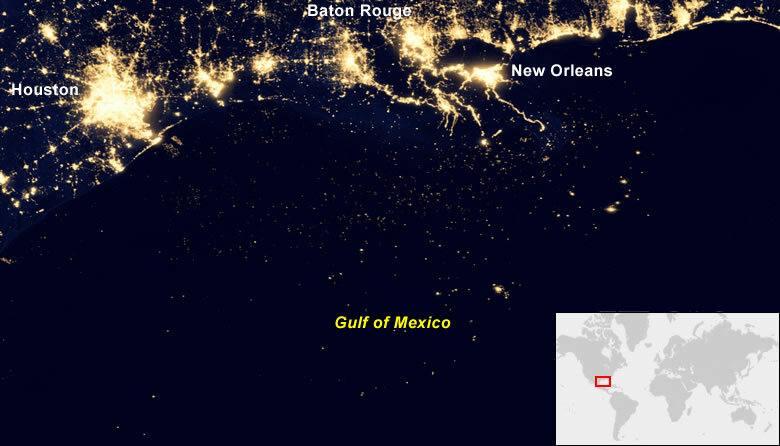 Hundreds of tiny dots in the Gulf of Mexico represent night-time illumination at oil platforms where drilling and collection activities are taking place. 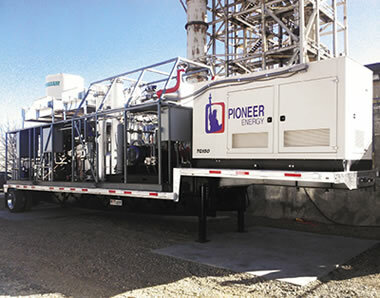 Many of these flare natural gas that cannot be stored, used, or transported to market. This satellite image was compiled by NASA; the annotations, caption, and inset map were produced by Geology.com. The Mexican Gulf Coast and the Bay of Campeche host a large amount of onshore oil activity and shallow-water offshore drilling. Night illumination and natural gas flaring allow these facilities to be detected by the Suomi satellite. This satellite image was compiled by NASA; the annotations, caption, and inset map were produced by Geology.com. Venezuela is one of the world's top oil exporters. It has some of the largest oil and natural gas reserves in the world. 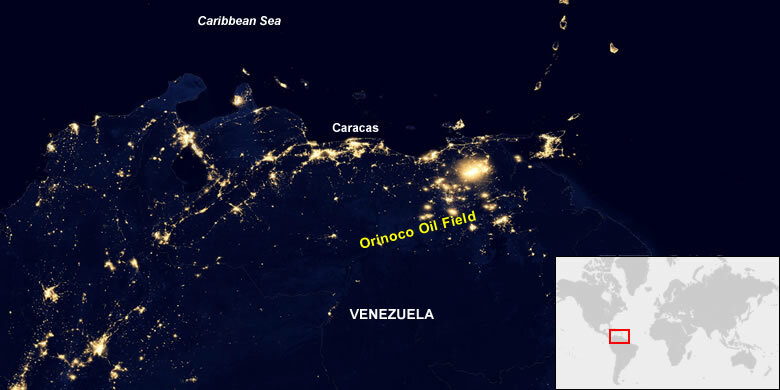 Night illumination and flaring in the Orinoco Oil Field make this area very visible on NASA's night-time illumination map. This satellite image was compiled by NASA; the annotations, caption, and inset map were produced by Geology.com. Brazil is the largest producer of liquid fuels in South America. 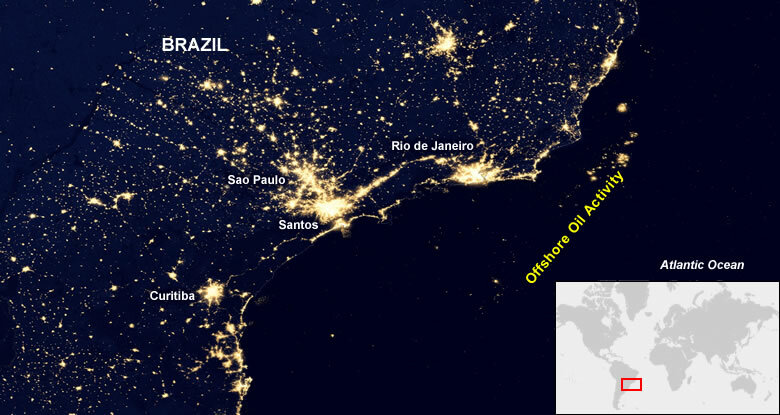 About 90% of Brazil's oil production is from deep-water drilling in the Atlantic Ocean, with most of the production in the Campos and Santos offshore basins. Much of the natural gas produced in these basins is flared. This satellite image was compiled by NASA; the annotations, caption, and inset map were produced by Geology.com. The North Sea is one of western Europe's largest sources of oil and natural gas and one of the world's most important non-OPEC production areas. 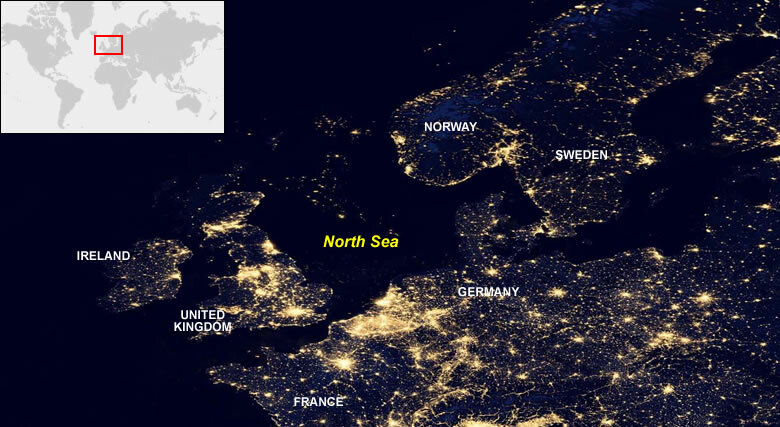 The small dots of light in the North Sea above are oil industry sites where night illumination and flaring are detected. This satellite image was compiled by NASA; the annotations, caption, and inset map were produced by Geology.com. 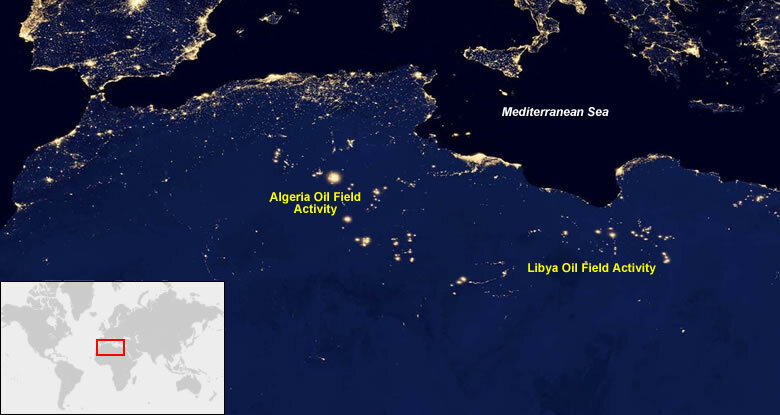 Algeria and Libya both have a large number of onshore oil exploration, production, and processing facilities. 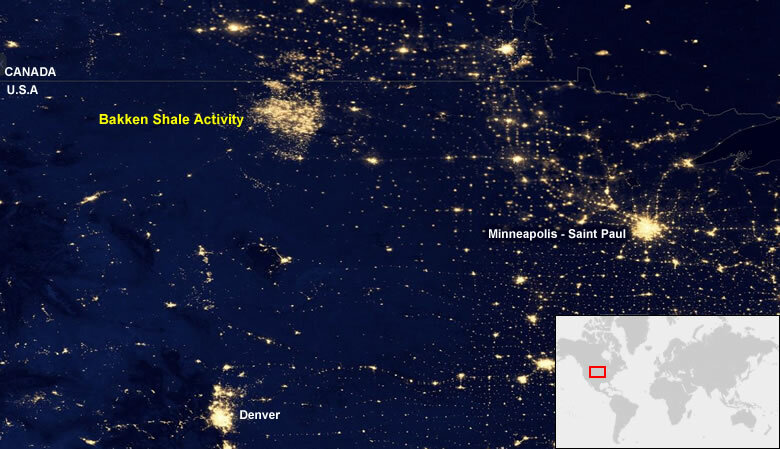 The map above shows areas illuminated at night by electricity or natural gas flaring. This satellite image was compiled by NASA; the annotations, caption, and inset map were produced by Geology.com. Nigeria is the largest producer of oil in Africa. Much of that production is offshore and in the Niger Delta where exploration, production, processing, and transport facilities are illuminated at night and where natural gas is flared because it lacks a local market or transport options. 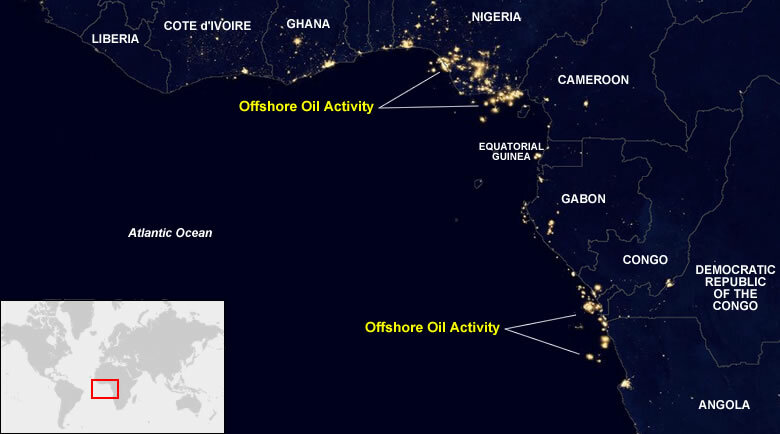 There are also numerous locations of oil activity offshore of Angola, Congo and Gabon. This satellite image was compiled by NASA; the annotations, caption, and inset map were produced by Geology.com. The Persian Gulf is one of the most active oil-producing areas in the world. There are thousands of onshore and offshore exploration, production, processing, transport, and refining facilities operating there at any time. This satellite image was compiled by NASA; the annotations, caption, and inset map were produced by Geology.com. 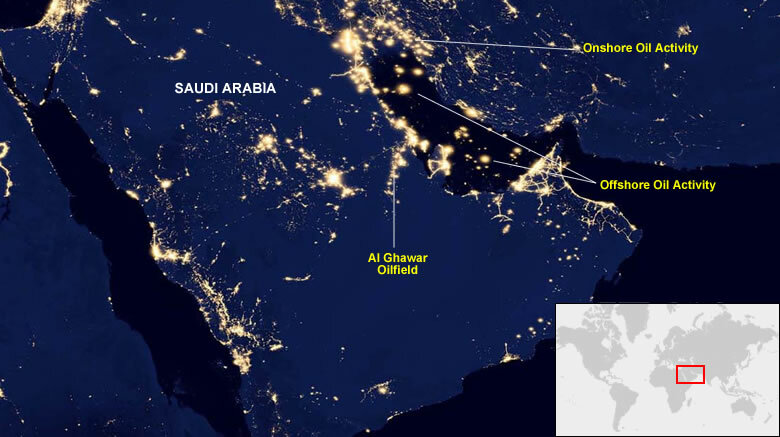 The map also shows the geographic extent of active oil fields revealed by their electric lights, and, the light and heat produced by natural gas flaring. The flared natural gas was originally dissolved in the crude oil and came out of solution at the time of production. Drilling companies burn it by flaring because the gas is inconvenient or unprofitable to use on the drilling site, or, because it is to costly to transport to market. This practice produces a large flare of burning gas that illuminates the surrounding area and vents heat and pollution into the atmosphere. In June, 2015, over two years after the images were published, researchers at the University of North Dakota released a study that reports that the images were "highly processed, manipulated and inaccurate". They said that the images made uninformed citizens think that natural gas flares were lighting up the land "as bright as a major metropolitan city". [5, 6] No data was provided on the number of citizens who actually believed this. It is unlikely that NASA contrived these images to make the public think that the landscape of northwestern North Dakota was "as bright as a city". Instead the dots of light on the images simply represented points of heat or light intense enough to be noteworthy. NASA prepared the the images in the same manner as a mapmaker prepares a road map. They placed a dot at each location with noteworthy illumination. There were lots of them. Mapmakers place symbols on maps to mark the locations of airports, schools, or cities. Each symbol marks the location of a noteworthy feature. The area on the map covered by each symbol usually does not represent the size of the airport, school, or city. The symbols simply mark their locations. Most people understand this. About Suomi NPP: article describing the Suomi National Polar-orbiting Partnership satellite on the NASA website, last accessed December 2016. Visible Infrared Imaging Radiometer Suite (VIIRS): description of the VIIRS data records on the NOAA website, last accessed December 2016. NASA-NOAA Satellite Reveals New Views of Earth at Night: article on the NASA website, last accessed December 2016. 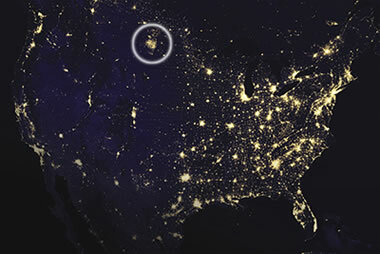 Gas Drilling, North Dakota: Satellite image map of the Bakken oil field showing night illumination, article on the NASA Earth Observatory website, last accessed December 2016. North Dakota Aims to Reduce Natural Gas Flaring: article on the Energy Information Administration website, last accessed December 2016. Study Shows Bakken Natural Gas Flare Satellite Images Aren't Accurate: article on TheDickinsonPress.com website, last accessed December 2016. Bakken Flares and Satellite Images, The Science and the Facts: University of North Dakota, Energy & Environmental Research Center, copyright 2015, last accessed December 2016. Gas Conversion Systems Reclaim Fuel for Industry: article on the NASA website, last accessed December 2016.
wastes a limited natural resource. This was a good discussion to assist. It occurred at a time when conserving natural resources, protecting budgets, and global climate change were prominent in the news - they still are. The discussion encouraged government agencies and energy companies to reduce the amount of gas wasted by flaring. Not a bad thing to do.